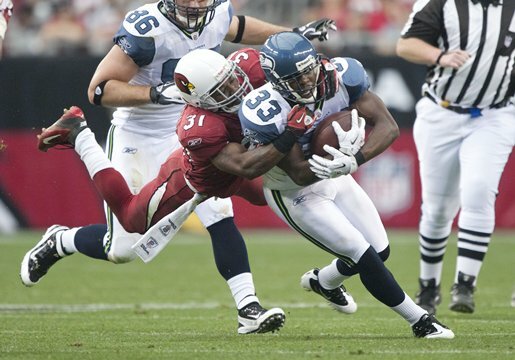 Apparently the Seahawks and Cardinals were as evenly matched as the team’s records suggested. With both teams starting slow and surging at the end of the season, each was looking to finish the year with a .500 record and the emotion coming from both sides of the field reflected that desire. Seattle squeaked by with a three-point win at home in the first matchup between the two teams, but it was the Cardinals who ultimately edged the Seahawks by the same margin on their home field on Sunday with a 23-20 win in overtime. For the second time in as many weeks, the Seahawks had several opportunities to pick up a win but simply made too many mistakes that, when added up, were simply too much to overcome. Personally, I put a lot of the blame for the loss on Larry Fitzgerald. The guy made some freakishly good catches when the Cardinals needed it most, and they seemed to come when he was well covered. He showed exactly why he’s the go-to guy when the game is on the line, because he was consistently making catches that only Hall of Famers make. But while allowing a guy like Fitzgerald to make some amazing catches can be somewhat forgivable, allowing Cardinals speedster Patrick Peterson a free run at blocking a Steven Hauschka field goal was more difficult to take. Then again, if the Seahawks are able to get into the end zone just one of the two times they settled for a field goal inside the 10-yard line, a mistake like that would not have made a difference in the outcome. Both inside the red zone and out, there was definitely a fair share of conservative play calls when most fans would’ve liked to see the team be more aggressive. Tarvaris Jackson made a few mistakes as well, but there were many times where Seahawks receivers weren’t giving him much help either. If it were a game that cost the team the playoffs, Ben Obomanu might be having nightmares of balls bouncing off his hands throughout the offseason. For the second straight week, Jackson had the ball in his hands in the final minutes of the and was unable to cash in a win. Not performing in those kinds of clutch situations certainly won’t help win over any of his detractors. Coach Pete Carroll was hesitant to put a lot of blame on Jackson during his postgame talk on The Pete Carroll Show. One player who provided an exciting preview for next year was Ricardo Lockette. The guy has amazing speed, and showed off that skill as well as some tremendous concentration coming down with a 61-yard touchdown catch that he was able to tip into his grasp. Unfortunately Marshawn Lynch’s touchdown streak ended against the Cardinals, but Leon Washington started one of his own on a 49-yard run that allowed Seattle to tie the game at 10-10 early in the third quarter. Washington talked about his optimism for next season based on how the team finished the year. For the most part, I think despite the two losses to division rivals in the final two games, the team as well as fans are optimistic about the future of the Seahawks. Coach Carroll expressed his enthusiasm about the team’s future during his weekly TV show. The loss leaves the Seahawks with either the 11th or 12th pick in the 2012 Draft. The position will be determined by a coin flip at the upcoming NFL combine in late February. So despite having the same record as last season, the Seahawks finish third in the division behind the 49ers (12-3) and Cardinals (8-8), while the Rams (2-14) go from NFC West runner-up last year to the cellar. With San Francisco in the playoffs, I’m interested in knowing what your post-season rooting ritual is when Seattle isn’t there. Some people cheer for our division rivals, which I didn’t have as much of a hard time doing when it was the Cardinals, but rooting for the 49ers just seems a lot more difficult. Or maybe you just root against the teams that you really want to lose. Maybe I’ll cheer for the Ravens and Giants to make the Super Bowl. That way, regardless of the outcome, the Seahawks will have beaten the Super Bowl champion. I’m not sure if that will make me feel any better or worse about the season, but at least it gives me something to root for. Check out the home opponents for next year! There are some tough games, but how great would it be to see wins at home against the 49ers, Packers, Cowboys, Patriots, and Jets? Seattle has been fairly mediocre at home over the last few years, so next year would be a perfect time to get back to those years of going 8-0/7-1 at home. The official 2012 schedule, with playing dates and times, will be announced in the spring. 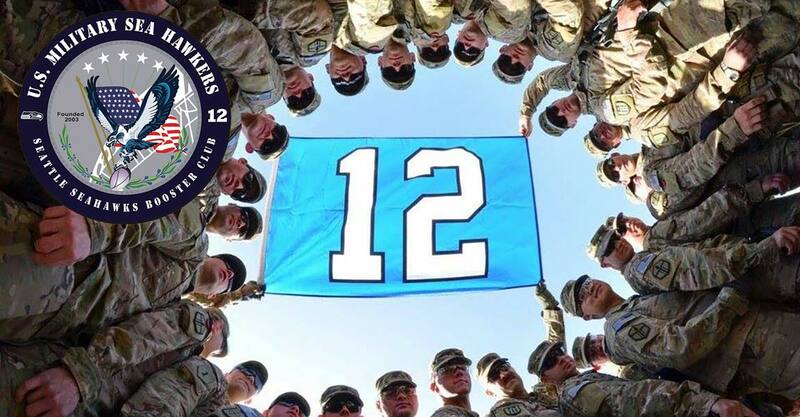 I want to wrap up this final recap of the season by thanking all of you, first for the service you’ve given our country and second for being a part of this group of dedicated Seahawks fans. Our club president Master Sgt. Traci Williams and the members of our Military Sea Hawkers Honor Guard do an amazing job at each home game representing us all, and they deserve a huge thanks. Thank you for listening to all of my rambling previews, recaps and emails, and there’s nothing that feels better when I get emails every now and then. Whether you want to discuss a particular point, ask a question, or offer words of encouragement, you know I’m always happy to respond. One thing that we did this year that I’m particularly proud of is just how many current and former service members we were able to get to football games this year. Of course it wouldn’t have happened without the generosity of so many patriotic fans, the Seahawks Vice President of Community Relations & Special Projects Mike Flood, and others within the Seahawks organization. In all, I believe we were able to pass on more than 50 tickets through our club to fellow Military Sea Hawkers and family members. Once again, thank you. Hope you all enjoy “The Year of the Twelve,” and I’m sure we’ll continue to check in throughout the offseason. Happy New Year to you all!